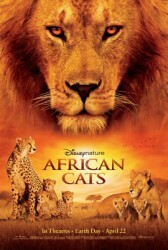 Here is one to put on your to-watch-list: African Cats. This documentary (you could even call it a movie) by Disney Nature centers around a young lioness named Mara and a cheetah mother called Sita. Both must face several challenges of the wilderness. When Mara’s mother passes away, she must survive on her own, not knowing if she will find a new pride and if she will be accepted or become an outcast. Sita has to raise and protect her 5 cubs from many threats, including starved hyenas and deprivation. The documentary is narrated by the acclaimed actor Samuel L. Jackson, who does an outstanding job. Its nature at its most beautiful and most delicate. The images are beautiful as is the story on its own, as tragedies interchange with happiness, all facets of life for these big cats are portrayed. You really want to see the trailer!